Tzolkin Date: 1 Lamat. Ruler is Yellow. Blocker is Turquoise. Gatekeeper is Golden Planet (Sun). Associated Qualities: Harmony, starseed, beneficial, fertility, combinations, way-shower, octave, expanded love, clear perspective. 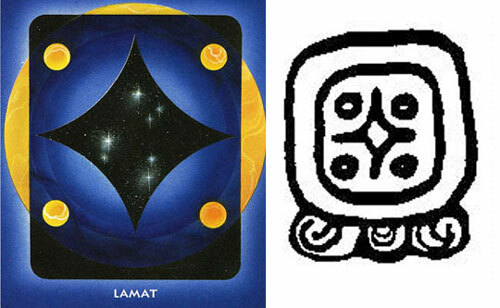 Lamat, is the Mayan Star or Venus glyph. Many modrn Mayan commentaries say Lamat is all about Love. Curiously, in classic Western cultural myths, Venus is similarly linked with Love. Venus, after all, was the Roman goddess of Love. To be a spiritual archeologist means to recognize such universalities with humanity’s spiritual traditions. So it’s exciting to recognize this particular commonality. The entire Tzolk’in calendar is based on astronomical relationships between the Earth, Venus and the Sun. This illustrates how significant the planet was for the Ancient Maya. Lamat’s association with the rabbit speaks of fertility, multiplying abundance, growth, gentleness and harmony. It’s a Southern sign so it has that southern ease, generosity and eagerness to please. There’s a story from Homer’s Odyssey that always comes to my mind when Venus is the topic. It tells of Aphrodite, (the Roman’s Venus) having a tryst with the God of War, Ares. Zeus arranged for Aphrodite’s marriage to Hephaestus, God of Fire and the Forge. She was not so thrilled to be wed to a lame god. Hephaestus was angered by the tryst and ensnared the two in an unbreakable chain-link net so small as to be invisible and dragged them to Mount Olympus to shame them in front of the other gods. Although the Gods laugh, Mercury, Messenger of the Gods, states that he would gladly put up with such shame if it were to mean having Aphrodite’s love. When I heard this story, it was explained that Venus and Mercury were in conjunction at the time of the death of Jesus Christ, thus linking humankind’s salvation through love to the activity of communication. I understand that these myths and tales are not empirical evidence for anything…at least not until humankind can see more deeply into reality! But linking love and communication with the salvation of humankind? I’ll go with that! And love, whether it be Lamat or any day of the year….I will sing its praises. This entry was posted in Uncategorized, Wellness and Spirituality and tagged Du'TSu, Lamat, Love, Pa'Ris'Ha, Tzolkin, Wellness and Spirituality. Bookmark the permalink.